Francis Thicke is a man with experience… deep organic farming experience. 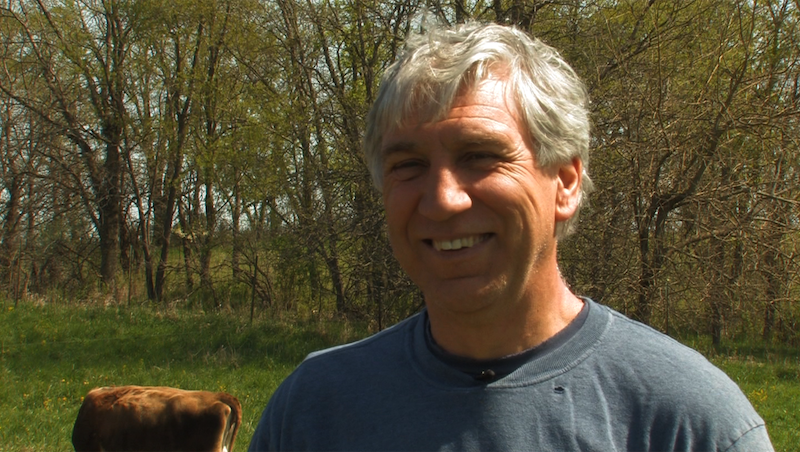 An organic dairy farmer in Iowa, he has also worked in agricultural administration in Washington and he is a food scientist with a PhD. He’s known locally in South East Iowa for his idyllic organic farm, Radiance Dairy, where he produces raw milk and traditional yogurt, cream and cheeses. Perhaps this is why Francis decided to run for political office. Most people would have been happy to settle back and enjoy such an idyllic life on a beautiful organic farm. However, Francis couldn’t help but notice that the raw milk he produces is technically illegal. When traditional foods like raw milk are illegal, you know you have to stand up for your beliefs. When 90% of Iowa’s food is imported from abroad, you know you have to stand up for local family farms. When you realize that running for office in Iowa is a small stepping stone from changing national policy, you have to do it! Francis is the opposite of big business agricultural corporations. With his wife Susan at his side, Francis’s farm is the traditional American family farm of yester-year, but working as a successful, thriving business for the future. He knows how to get America’s family farms back up and running, and how to grow safe food right here in the US, without the need for Monsanto’s chemicals, and with American farmers profiting financially. Iowa will vote on November 2, 2010, and you can help Francis Thicke lead the way for American agricultural policy, on a national level, by making sure he wins the election. Find out more about Francis Thicke and how you can support his campaign here, and ‘like’ him on Facebook. 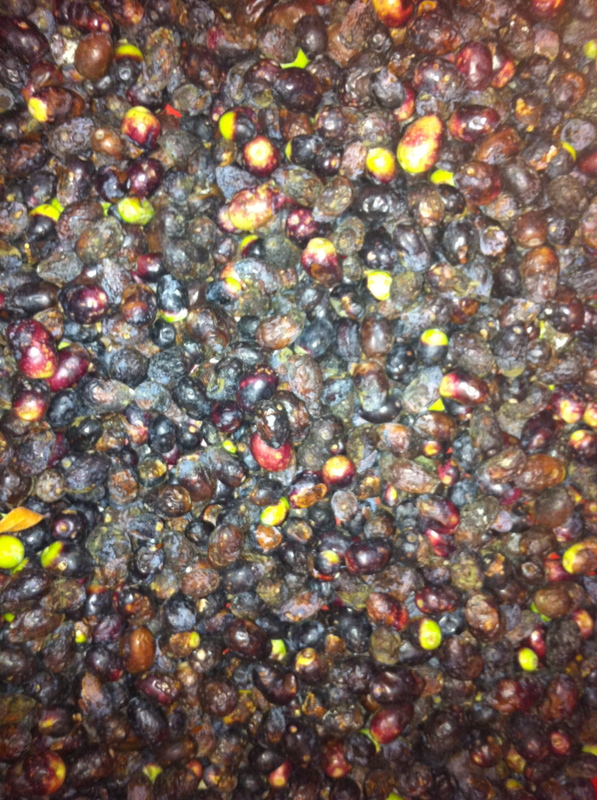 Here are some organic olives picked from a tree in Bel Air, Los Angeles. As you can see, some of them are still unripe and green, and some of them are turning black. I’m waiting for all the olives from the tree to go black, and then I’m going to dry cure them. 1. Pick your olives when they’re ripe and black. 2. Check them all to make sure they’re not bruised, damaged or rotting in any way. 3. Wash them and lay them out in a single layer on a towel so they can dry. 4. Weigh the olives. For every pound of fruit you will need a pound of raw fine ground sea salt or kosher salt. 5. Get two empty wooden fruit crates from your local farmers market or from any supermarket. 6. Line the crates with fabric such as burlap, hessian, cheesecloth or an old sheet. Nail the fabric in place, making sure the air will be able to circulate into the olives through the open slats in both boxes. 7. 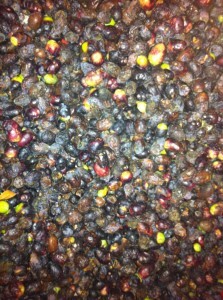 Pour a layer of salt at the bottom of one of the crates, then add a layer of olives. Keep layering the salt and the olives until everything is in the box. 8. Leave the crate outside in a dry, covered area for one week. Place the crate on a hard surface of some kind, and be aware that the crate is likely to leave a stain wherever it is. 9. After a week has passed, pour the contents of the crate into the second crate, then put it all back into crate number one by hand, olive by olive, checking each one as it goes for any mold or damage. Mold damage looks like white mildew… any olives which are looking even slightly suspicious need to be removed. 10. Repeat this selection process every three days to ensure nothing goes moldy, and to keep the salt and air mixing with the fruit. 11. The olives will be ready in 4-6 weeks. They’ll look black and shriveled and delicious, and the bitterness of the raw fruit fruit will be replaced by a delicious cured olives flavor! 12. If the olives seem a little tough, you can tenderize the waxy skins by blanching. Boil a pot of water, then using a slotted spoon, throw in the olives in small batches, allow to sit in the water for about 20 seconds, then remove with a slotted spoon. Don’t allow them to sit in the water longer than 30 seconds or else they’ll cook. 13. Lay the olives out to dry overnight. 14. Refrigerate and eat within six weeks if you can resist eating them all for that long, or alternatively they can be canned in brine or frozen.